I thought I’d take today and give you some updates about our life living in the middle of chaos and confusion. Things have been flying past me at 80 m.p.h. both literally and figuratively. My daughter has gone back to work so guess who’s babysitting? Good Guess!!! I just couldn’t stand the idea of my babies being with strangers all day. So now they are with their grandma and great grandma. 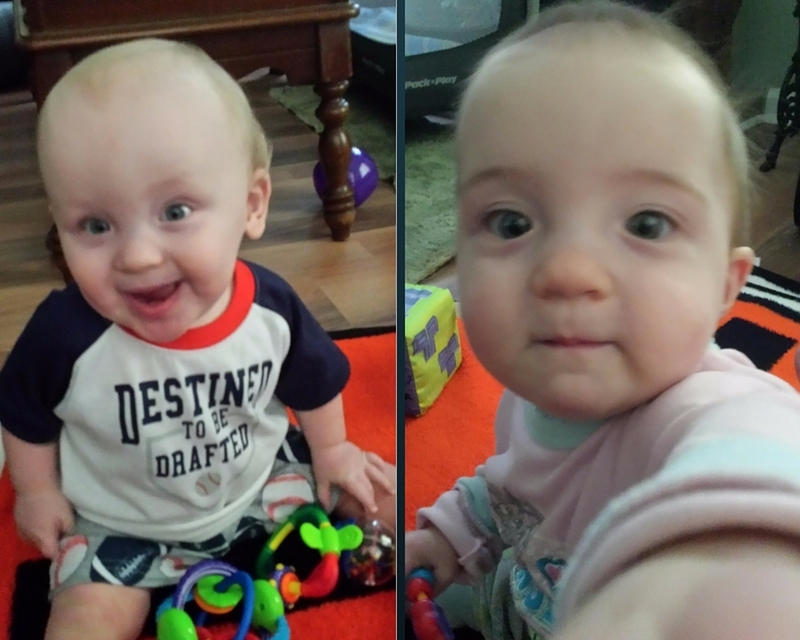 I can’t believe they will be 10 months old on the 5th of September. They’ve come a long way as you can tell by the pictures! We’re working on getting our routine down, but so far so good. We are also bursting at the seams with baby equipment (think 2 of everything!). The benefits far outweigh any hardships. The babies are safe, happy, and being spoiled rotten. My daughter can go back to work without the added worry and stress of worrying about her babies being taken care of. 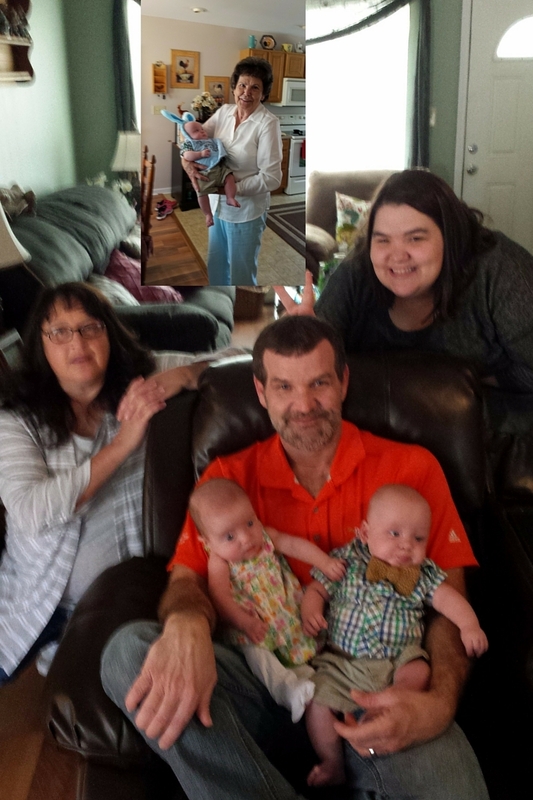 Having the babies here so much has had such a drastic improvement with mom. She enjoys helping take care of them and playing with both. She’s more alert, engaging, and happy which is always a great thing! My new website is almost complete. Rena’s World.com is up and running and I will be adding content very, very soon! It will be a mixture of “bloggy news”, “creative writing challenges”, “book reviews” and maybe some travel destination around the U.S. Stop by give it a once-over and tell me what you think so far! I would like to invite you to sign up for my future posts right here. I would love it if you would stop by and like my new Rena’s World Facebook Page and follow me on Twitter right here! These are separate from T.D.A.C., so if you want more of me come on over! Speaking of T.D.A.C. it will still be right here as always. We will go back to focusing on Alzheimer’s Disease & Caregiving and how it is affecting our family as well as other Social Awareness projects with some product reviews thrown in to keep it interesting. One little sentence can haunt you for days! During the writing process you weave amazingly beautiful words together and then comes the editing where you unravel it all like a crocheted chain and rework them again and again until it’s perfect. As you can see, I’ve added a few more balls into my juggling routine. Let’s just hope I don’t drop one and end up with a concussion! WHAT’S GOING ON AT YOUR HOUSE THESE DAYS? You are amazing! I mean that. Can’t wait to reconnect with you at BAM! Big hugs to a Super Nana! Sounds like you are getting it all organized – a huge feat for such a busy lady. Love the new site – looking forward to it! Can’t wait to read the book! Thanks Carol! I appreciate you so much! Pia, you are the sweetest. Thanks so much…and I can’t remember either! Seems like years! So much going on, and all good news. I love not only that you’re spending so much precious time with the babies but that it’s having a good effect on your mom. And you know I’m so excited about your book and your new site. Thanks Karen! That’s one of the best parts of babysitting…that and all of the slobbery kisses I want! You are an amazing supermama and daughter and grandma, Rena! My favorite thing here is how your Mom is enjoying the twins! What a great bonus and boost for her! It is a lot of work but so fun too! We watched our twins for a couple years….they are almost 8 now. You’ve made the best decision for everyone…..and they will all benefit believe me. Congrats on completing your book, kiddo….what an accomplishment! loving your new blog too……thanks for this catch up sweet lady! That’s my favorite thing too Joan! It’s been so good for her. Thank you so much for your very sweet words! I can’t wait to see who they will be at 8, but I hope it takes it’s time getting here! You are busy and productive…can’t imagine you any other way! Those babies are yummy looking! Amazing you, go Rena!The babies have come along adorably! Thank you Haralee! I am hopelessly in love with the both of them! Congrats on the completion of the book. You have a lot of wonderful things happening right now in your life—you are blessed, my friend! Thanks Marcia that I am! We both are I believe! Whew – and I thought I was busy! Can’t wait to read your new blog. Your grandbabies are so beautiful and it’s such a great experience to get to babysit them while your daughter works. Have a great weekend – get some rest :)! Thanks Lana! I love having them although I have to admit by the time she gets home I am exhausted! You are amazing, Rena! I’m so inspired by your attitude. And those babies, I wouldn’t mind helping out with them! Such darlings! Thank you so much Corinne! Yeah they definitely make it easier!! Now, I can’t stand not to have them around! Welcome to the Grannie Day Care Club! It is the best organization on earth! I’m like you, I never wanted to see my babies going to strangers. And they keep you young. Tired. But young! I’ve read that having close contact with little people has dramatic results for people suffering with dementia-like problems. So glad your mom has this chance. I agree Diane! Even with the gift of the stomach bug it is still so worth it. The change that’s come over her since the babies has been remarkable! How wonderful for your daughter that you’re taking care of the babies, and what a wonderful side benefit that your mom is enjoying it! You’re such a good person, Rena and I admire your positive energy. AND….the new website is cool, love the graphic design on the opening page! Oh gosh! I didn’t realize that you had started a new blog, even though I’ve signed up for the Facebook page and Twitter! LOL!! Congrats on completing your first book!! Awesome news!! Thank you so much Roshni! I have to admit that I am thrilled. It’s always been a huge dream of mine! You are not just “juggling some balls” Rena – you are a professional juggler!!! I am ashamed that I felt a need to take a blogcation last week, when I hear of all that you are doing. Do you ever sleep?! A new website?! Headed over right now to sign up and follow. Can”t wait to read your book! Aw thank you so very much! I do sleep…a little! haha! I am a late night person which gives me plenty of alone time for my writing because everyone here is asleep by 7! OMG, Rena, how do you do it??!!! I’m sure you’ve been asked that question a million times but it’s my way of saying how amazing you are! Your daughter and grandkids are super fortunate, and I can’t wait to see the new site too! And oh!….67k words! woot-woot!!! You are a SUPERWOMAN!! Thanks Joy! I appreciate your friendship so much! I wouldn’t be who I am today or be able to do any of it without this amazing thread of support that I have. It’s been an amazing adventure so far and I can’t wait to see what happens next! Sounds like you’re all set Rena! Congrats! Thanks Liv! We are used to being circus performers around here! You are doing Great !!! Babies are really our source of Joy. Thanks for sharing.